I created and cooked a special recipe for yesterday's Thanksgiving feast. It's called "Not a damn thing". It didn't have much taste but it was low on calories! Nah, the kitchens of Nibble Me This were shut down as we headed over the mountains to Franklin, NC to spend the day with my side of the family. My mom cooked our traditional Thanksgiving feast which somehow manages every year to outstrip "nostalgia inflation" (where things tasted better in your memory) and be as fantastic as ever. 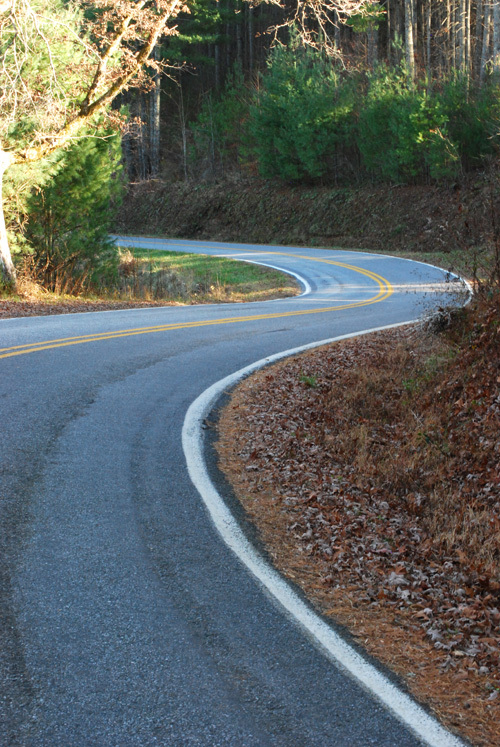 Yes, the actual road, not stock photo. 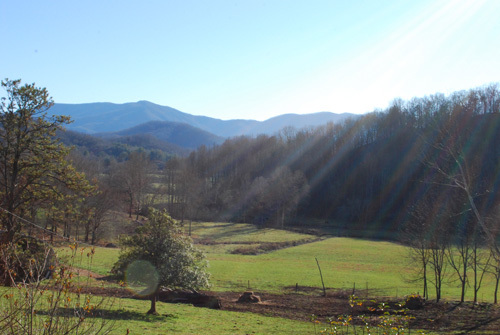 The cabin property is on the extreme right of this picture. 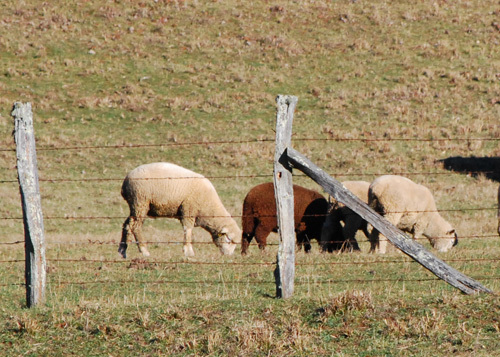 Holy crap, my mom wasn't kidding, there IS a red sheep in the herd. 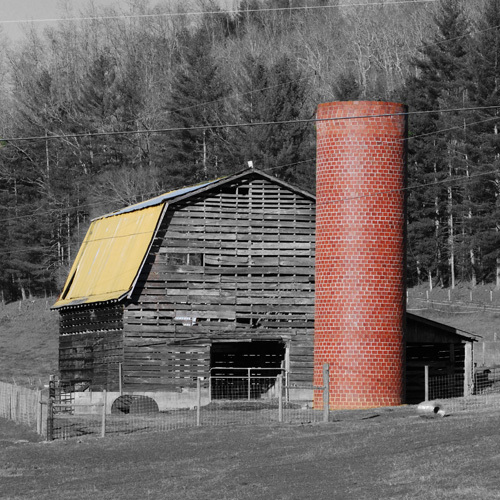 The red brick silo in the picture was the inspiration for today's recipe and my 500th post - Silo Brick Grilled Cornish Hens. 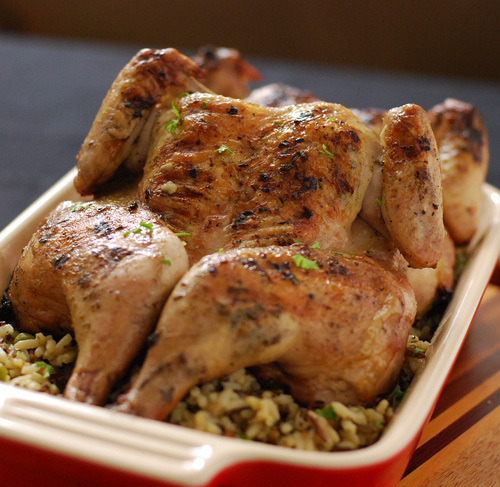 Mix the brine ingredients thoroughly together and brine the hens for 4 hours. 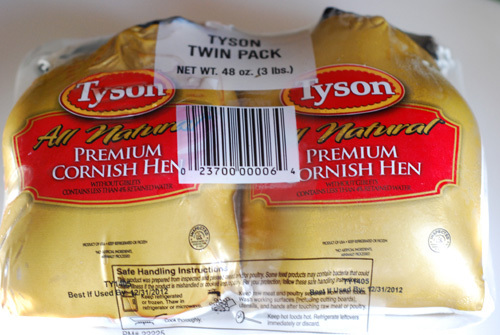 Mix the compound ingredients together with a fork, refrigerate, and take off refrigeration 1 hour before using. Heat oil in a small sauce pan to 350f. Fry sage leaves about 1 minute and remove. Fry garlic cloves until done, about 2-3 minutes, and remove. Let oil cool. 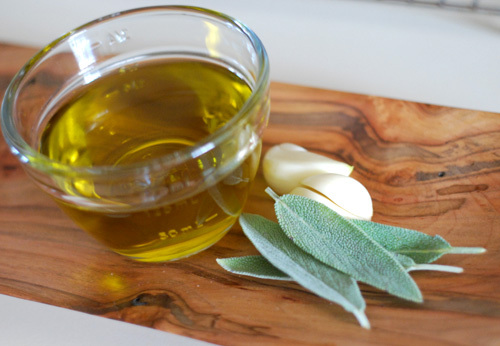 Place sage, garlic, pepper and oil in a blender or food processor and blend together. 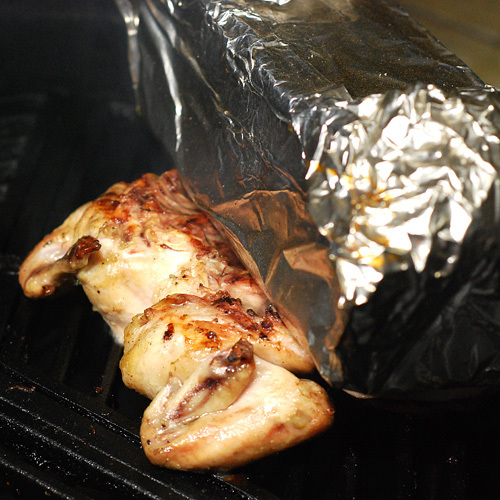 Preheat your grill and two foil wrapped bricks to 400f. On the Big Green Egg, I used a raised grid set up where the meat is 8" from the coals. If your grill can't adjust the height from the coals, drop the temp to about 350f and carefully monitor the internal temps. Spatchcock or butterfly the hens by cutting out the backbone with kitchen/poultry sheers. 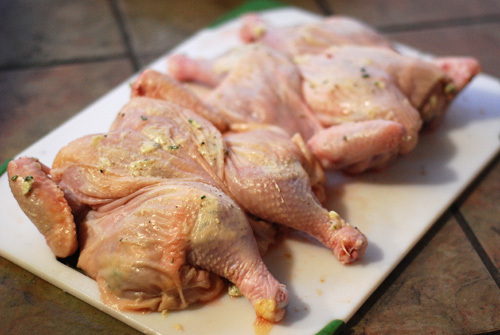 Work your finger under the skin and spread the softened compound butter over the breast, thighs, and legs. 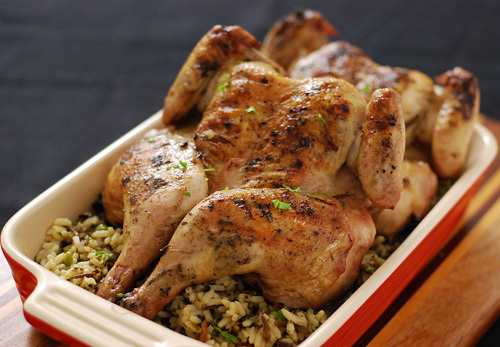 Place birds bone side down, weigh down with bricks and cook 6 minutes. Rotate birds 90 degrees and weigh down again for another 6 minutes. 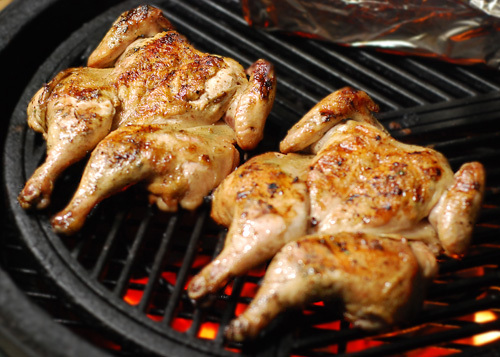 Remove birds from grill (to prevent flare ups) and drizzle some of the sage oil over the skin side. Flip and drizzle sage oil over the back. Return to grill skin side down, top with bricks, and cook for 3 minutes. Rotate 90 degrees and cook another 3 minutes. Temp check thighs (175f) and breasts (160). If not done, slip bone side down and finish to those temps (shouldn't be another few minutes). 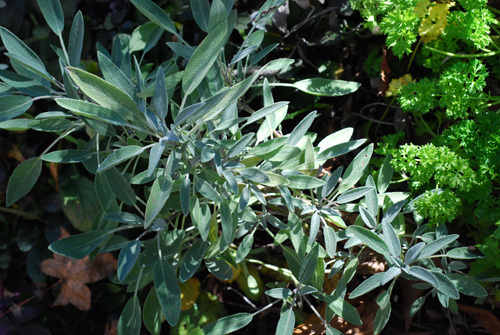 With the weather getting cold, sage is one of the last herbs surviving in our garden. You won't use all the oil, save the rest for other dishes. If you can't get "all natural", reduce the salt content of the brine to 1/4 cup. Getting the butter/herbs under the skin seasons the meat better. 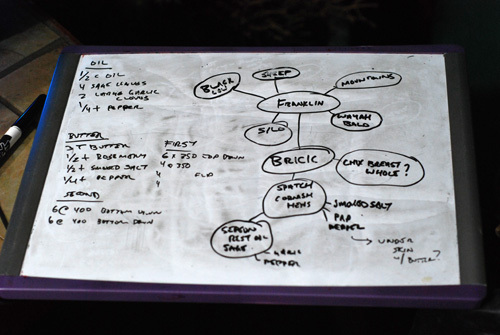 A glimpse into how I come up with recipes. I started with the word Franklin and brainstormed. The brick helps flatten the birds for more even cooking. Finishing bone side down to get the desired final internal temps. The wild rice was a certain Uncle's box mix with frozen peas and crisped bacon added. I hope you all had a great Thanksgiving, spent time with family and arrived home safely!